In Part 3 of this article series about Kapfenberg, Markus Kamper, marketing expert for the city, already provided a touristic portrait of the city and the kinds of sights, festivals and hospitality offerings that are available. Let us now explore the magnificent region that surrounds Kapfenberg, the Hochsteiermark Region – or in English – Northeastern Styria. What about the region surrounding Kapfenberg? What is there to see and do? Please tell us about some of the key attractions in your area. 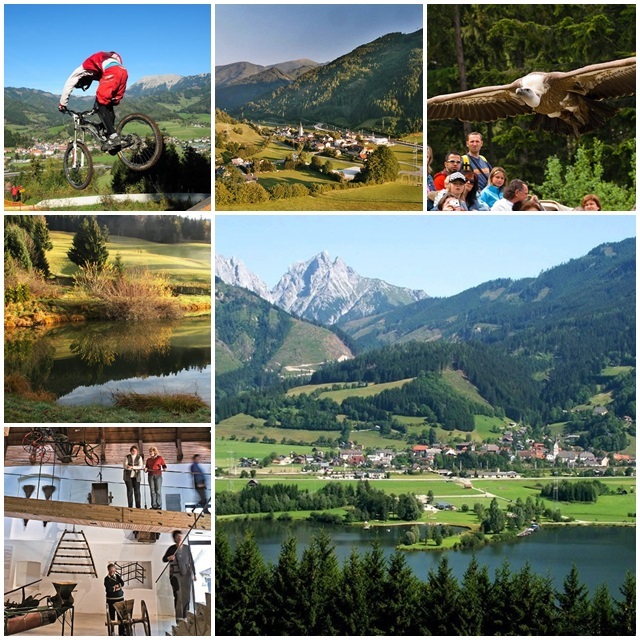 The surrounding Hochsteiermark Region (Northeastern Styria) has many natural, cultural and recreational attractions. Starting in the west are the Eisenerz Alps, a region that centers around the Erzberg („Ore Mountain“), a mountain with an open-pit mine where iron ore has been mined since ancient Roman times. The nearby town of Eisenerz („Iron Ore“) is a picturesque medieval mining town and just a few miles northwest is the Leopoldstein Lake with a castle of the same name. Leopoldstein Castle was built in the late 1600s and reconstructed in the late 19th century in the tradition of the fanciful Bavarian royal castles. The Styrian Iron Route stretches from the city of Leoben to the small towns of Eisenerz, Radmer and Vordernberg and highlights the mining history of this region; it is the heart of a region that provides countless opportunities for sports fans, skiers, hikers and paragliders. Kayaking and rafting on the Salza River will give an adrenaline jolt to adventure seekers. Less than 60 km from Kapfenberg is the ancient town of Mariazell, home of the Basilica of Mariazell, a baroque masterpiece that makes this town the most important pilgrimage site in all of Austria and one of Europe’s most visited shrines. Outdoor lovers will fall in love with the Hochschwab mountain range, a fierce limestone massif that reaches heights of 2,277 m (7,470 feet). The rugged Hochschwab is a real paradise for hikers, mountain climbers, mountain bikers, horseback riders, hunters and everyone else who loves to be active outside. The neighbouring Rax and Schneeberg mountains are also the water source for the fresh water aqueduct that still supplies drinking water today to the Austrian capital of Vienna. 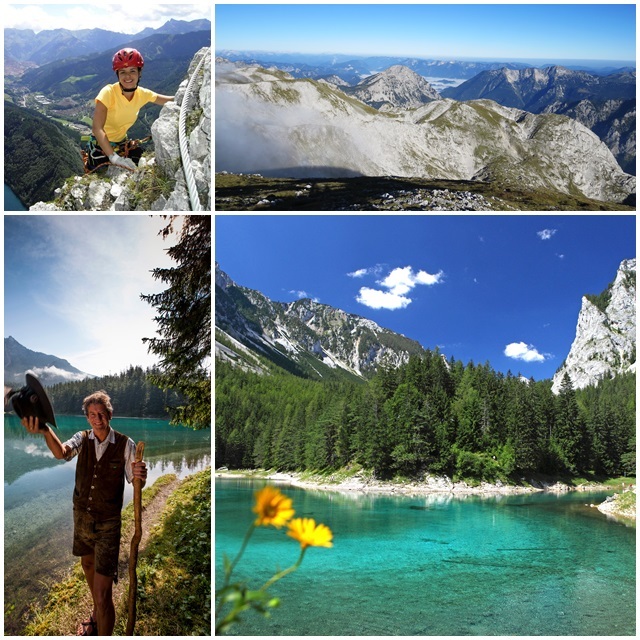 The Hochschwab region offers plenty of recreational facilities such as tennis, swimming pools, ponds and lakes. The untouched nature of the Hochschwab Region enchants with its Alpine flowers, orchids, and animals such as chamois who live on the steep cliffs of this rugged mountain massiv. The charming local villages of Aflenz, St. Ilgen and Thörl offer warm hospitality, diverse recreation options and spa services. Moving farther east is the region of the Styrian Semmering, the mountain pass that connects the province of Styria with Lower Austria. Once a favourite resort destination of the Habsburg imperial family, the villages of Semmering, Maria Schutz and Spital am Semmering have many different tourism facilities, including many impressive Art Nouveau hotels and villas that were built around the turn of the last century. One of the most famous attractions here is the Semmering Railway, an engineering masterpiece that was completed between 1848 and 1854 and became a designated UNESCO World Heritage Site in 1998. To the south is the Waldheimat Region, home of Austria’s celebrated poet Peter Rosegger, and a fabulous area for hiking. Winter sports enthusiasts will rejoice near Kapfenberg as there are 21 ski resorts in the Hochsteiermark region, and with the Romantic Ski Pass it is possible to ski and snowboard on 7 different mountains. The Naturpark Mürzer Oberland is a nature area that offers hiking, downhill skiing, cross-country skiing, ski touring and even climbing on frozen waterfalls. The region near the town of Kindberg and the Mürz Valley is known for its apple orchards and themed hikes through forests and meadows. Fall is one of the most beautiful and tastiest times of the year here when the plentiful fruits are processed into juices, jams, spirits and liqueurs. During the winter you can go tobogganing or curling. The natural toboggan run in Kindberg has already hosted world championships. 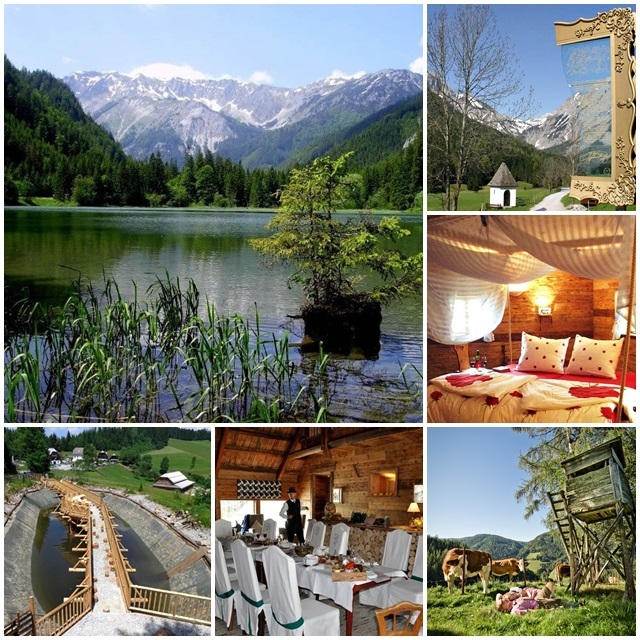 Close to Kapfenberg is the Pogusch region, an Alpine pass that is known for its romantic hospitality with more than 30 restaurants, hotels and bed and breakfasts where guests can enjoy the authentic rural charm of this area. Enchanting villages here include Turnau, St. Lorenzen im Mürztal and Frauenberg. One of the big local attractions is the „Romantic Bründl Path“ (Fountain Path), one of the longest barefoot walking trails that is surrounded by fruit trees such as apple, pear, plums, cherries and walnuts. The Pogusch Region is also home of the Steirereck Restaurant, one of Austria’s most highly rated eateries whose sister restaurant in Vienna is number 16 among the World’s 50 Best Restaurants. Near the village of Tragöß and about 30 kilometers (about 20 miles) from Kapfenberg is a unique natural attraction: the Grüner See (Green Lake), a glacial meltwater lake that is famous for its emerald green water. Every spring, the snowmelt from the Hochschwab Mountain accumulates here and reaches a depth of about 12 metres between about mid-May and June. From July onwards the water begins to recede again and is only one to two metres deep during the winter. With its crystal clear water, the Grüner See is popular with divers and has recently been voted Austria’s most beautiful spot. Even Ashton Kutcher sent out a tweet recently, raving about the natural beauty of this magical green lake. The Palten and Liesing Valleys provide outstanding hiking opportunities and boast various educational and experiential trails that will introduce you to local nature, geology and history. On these themed trails , you can, for example, learn about marine life in the Gaishorn Lake or educate yourself about geological phenomena in the Flitzen Gorge. The Forest Trail in Wald am Schoberpass will take you across three summits which you can climb with about 100,000 steps. And the mining trail in Kalwang will introduce you to the mining history of the area. The Trail of the Medieval Knights between Mautern and Kammern takes visitors back to the times of the robber barons of the Middle Ages. For those in search of spiritual experiences, the „Marterlweg“ connects numerous 47 wayside crosses, shrines, chapels and churches. Another themed trail closer to Kapfenberg is the „Keltenweg“, the Celtic Trail, that provides insights into the Celtic history and culture that prevailed in this area around 100 BC. From Kapfenberg it is not far to the other historic cities in the Hochsteiermark Region which include Leoben, Bruck an der Mur and Mürzzuschlag. All these cities are part of the important Mur-Mürz river valleys which played a pivotal role during the Industrial Revolution in Austria, due to the availability of water power and natural resources such as forestry and iron ore.
And of course, Styria’s capital of Graz is less than half an hour away. With more than 300,000 people, Graz is Austria’s second largest city and its Old Town is full of medieval and Renaissance buildings which makes it one of the best-preserved historic city centres in Central Europe. 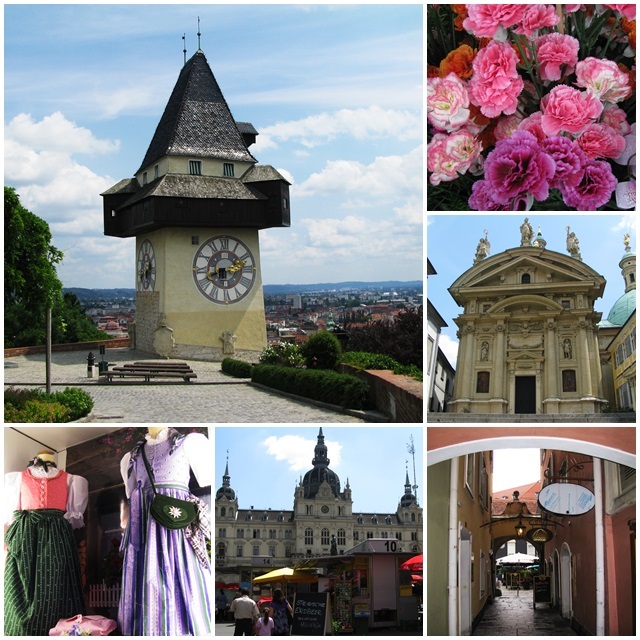 Since 1999, Graz has been a designated UNESCO World Heritage Site; it also became the Cultural Capital of Europe in 2003 and was awarded the title of City of Culinary Delights in 2008. As you can see, the regional travel opportunities near Kapfenberg are incredibly diverse and limitless. Northeastern Styria is one of those hidden gems whose time has come to be discovered. Thank you, Markus, for providing us with this great overview of your city. I travel back home to Austria every year and I already look forward to visiting your beautiful city next year during my upcoming trip to my native country.